It would be an understatement to say that Ernestine Shepherd is in better condition than most people. The 80-year-old bodybuilder lives by the words "determined, dedicated and disciplined" to stay in the best health possible. Yes. You heard that right. Ernestine Shepherd recently celebrated her 80th birthday. And she still works out every day. But this was not always the case, she says. "Earlier in life, I really did not think too much about eating correctly nor exercising, but as time went on, my mind changed completely." "My sister was instrumental in getting me started to lift weights and to try to become a bodybuilder." Then, in 1992, Mildred Blackwell died suddenly of a brain aneurysm. Ernestine says the loss deepened her commitment to good health. She promised to continue training as a bodybuilder to honor her sister's memory. "After my sister's death I first couldn't really do too much of anything. I was just so upset about her death. But then finally I got myself together, decided that I would start working out and I started working out with a friend by the name of Raymond Day. And we worked out three days a week." "My trainer the former Mr. Universe Yohnnie Shambourger. Wow, did he work me and get me into shape...Then after training with Yohnnie Shambourger I did my first bodybuilding show." "Yohnnie got a call from the Guinness Book of World Records stating they thought I was the oldest female competitive bodybuilding in the world, but they would have to check it." 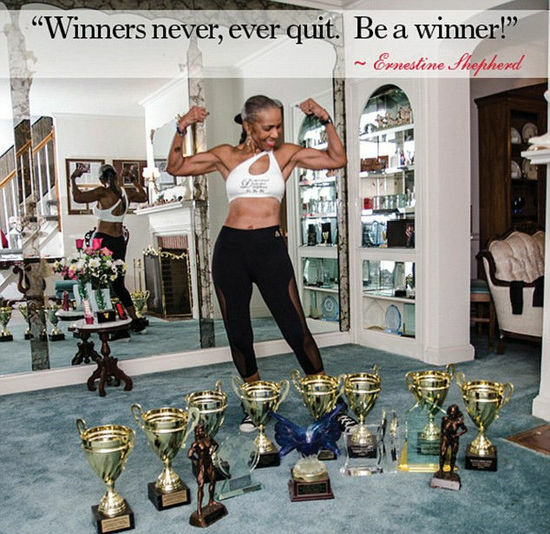 Ernestine Shepherd holds the 2010 and 2011 title in the Guinness World Records as the World's Oldest Performing Female Bodybuilder. And she gets support from Collin, her husband of 52 years. He helps prepare her seven small meals a day. "Physical activity in my later years has helped me, because at one time I suffered with high blood pressure, panic attacks, acid reflux. Oh, you name it. I had it. After I started working out everything changed for me. No more high blood pressure medicine. No more panic attacks. No more acid reflux. Exercise is not work, it's fun. It's a joy." Shepherd still competes in body building events. She also works as a fitness trainer and professional model. And, this year, she became an author. Her book, "Determined, Dedicated and Disciplined To Be Fit," came out in April, just before she turned 80. "If ever there was an anti-aging pill you will have to call it exercise." The box has been crushed out of shape. Tuesday and Thursday I have my fitness class, though. She' s starving herself trying to lose weight. With the rapid development of fitness clubs, fitness trainer groups are gradually on the rise and prosper. 1.She says she keeps a balanced diet of proteins and carbohydrates such as chicken and rice. You want to eat a balanced diet. What nutrients are necessary for a balanced diet? 2.Physical activity in my later years has helped me, because at one time I suffered with high blood pressure, panic attacks, acid reflux. The two continents were connected by a land mass at one time.